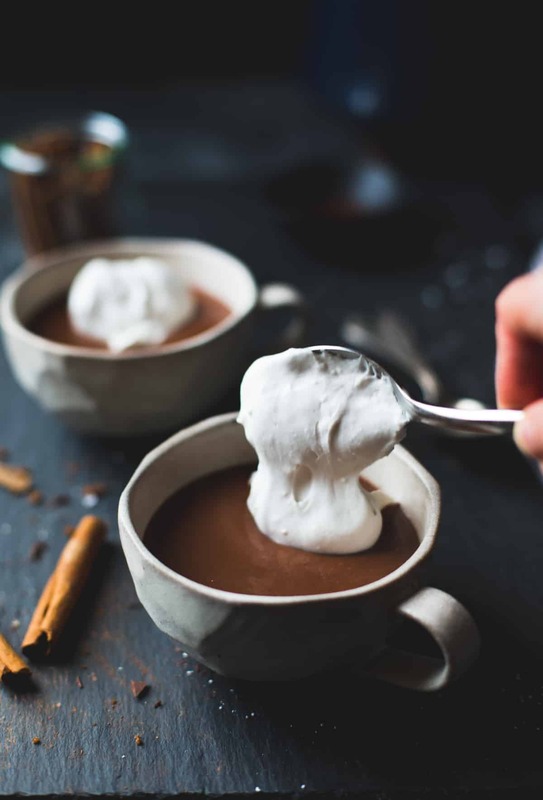 In this dairy-free version of champurrado, almond milk forms the base for spiced hot chocolate thickened with masa harina, all decked out in coconut whipped cream and hella chocolate. 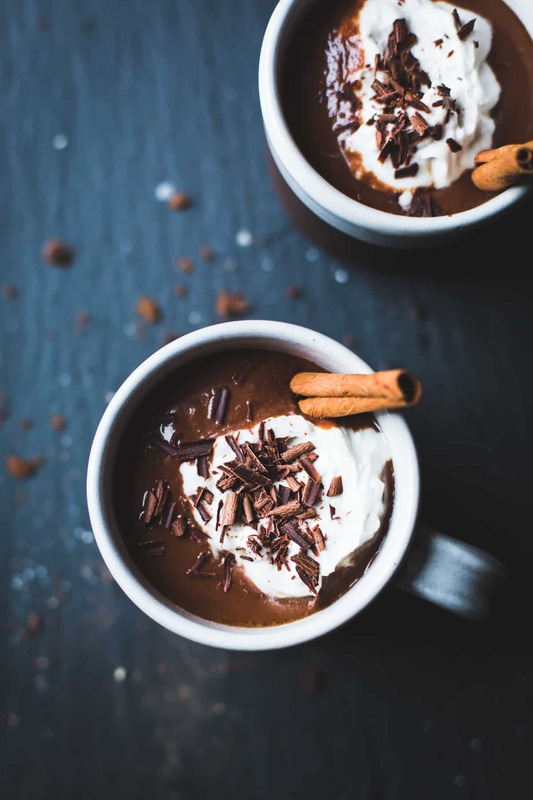 Champurrado is a chocolate-flavored version of atole, a warm, drinkable pudding of sorts made from sweetened milk and corn flour. 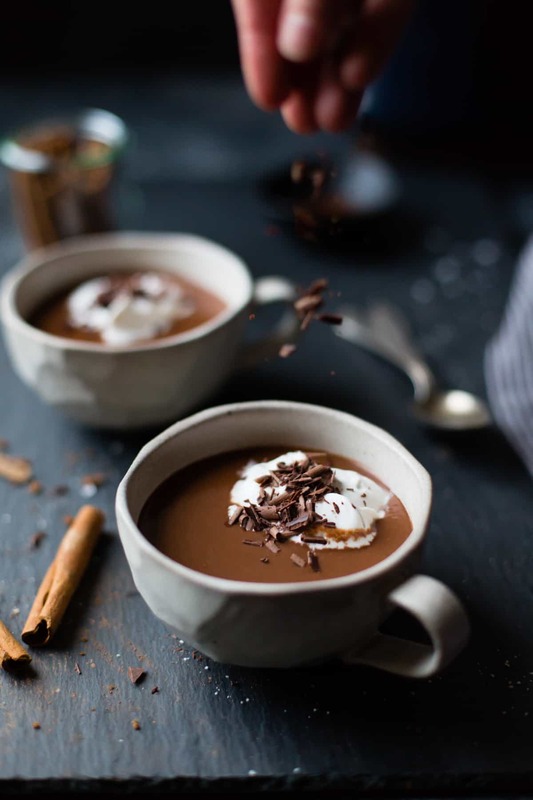 Atole and champurrado date back to the Mayans, who famously spiked their hot chocolate with sweet spices and chile. The masa harina adds a surprisingly pleasant thickness to the drink while maintaining little nubs of texture, making this taste a bit like chocolate pudding that you’ve just made and are surreptitiously spooning, warm out of the pan, straight into your mouth, while hoping no one is looking. This is hot chocolate pudding that you’re allowed to drink without looking like a pig. In fact, you’re even supposed to drink it for breakfast WITH CHURROS. 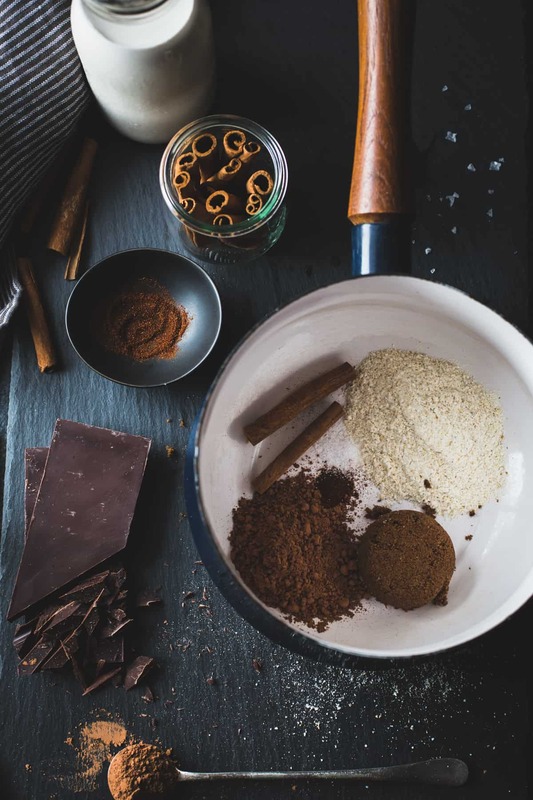 I first became champurrado curious during a stint as a pastry chef at a Peruvian restaurant, when I tried a version from Dulce: Desserts in the Latin-American Tradition, the book that served as my bible during that time. I tweaked the champurrado to my liking, and shared it among my co-workers who went wild for the spiced, warm chocolate drink. (I may or may not have spiked it with rum…) The champurrado never saw the light of day, however, due to an owner who disliked a) chocolate and b) printing new menus, thus we were forced to hoard it all to ourselves. 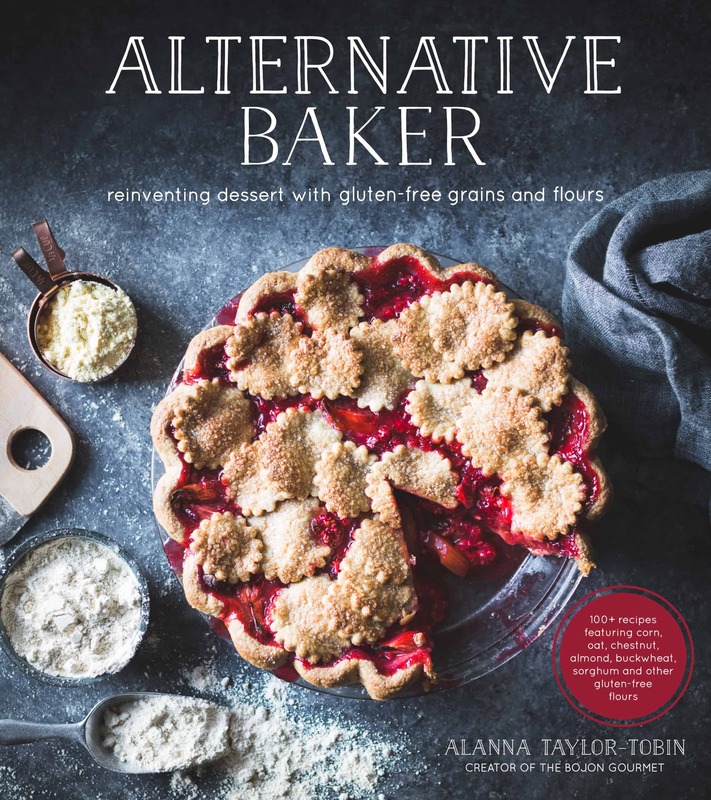 I wasn’t sad to leave that job, especially since doing so left me more time to focus on this space which has led to many wonderful things, including writing and photographing a cookbook all about desserts made from alternative grains. I was, however, devastated when I realized that I’d left my champurrado recipe tucked into the restaurant’s copy of Dulce, probably to be found by my successor (who I pray had better luck implementing interesting recipes than I did). So when I got a hankering for the drink the other day, I cobbled together a recipe based on my memory and a few online sources. Many champurrado recipes start with disks of Mexican chocolate, but I always find these to be overly sweet and lacking in chocolate flavor. 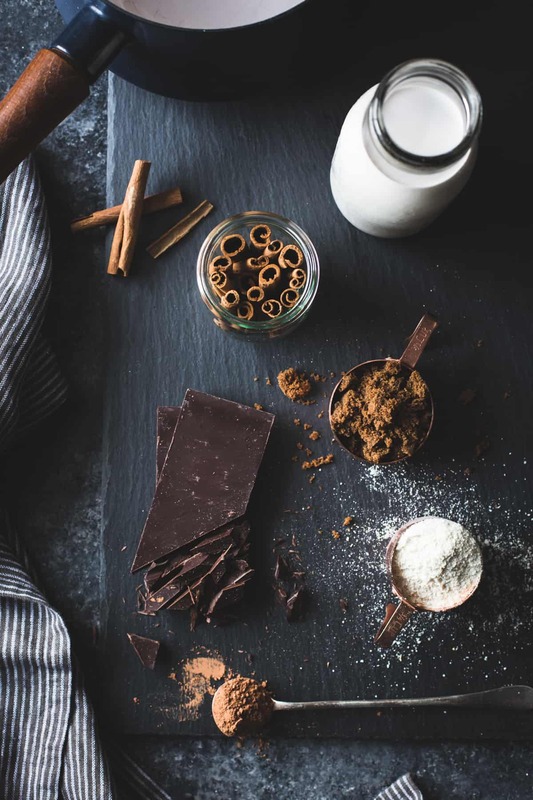 I prefer to use good bittersweet chocolate, deep, dark muscovado sugar, cinnamon sticks and chile powder for a little kick, and cocoa powder for extra chocolatey richness. Best of all, champurrado is easily made vegan; in fact, I like this version better than the original. Almond milk creates a light base that allows the flavors of chocolate and spice to come through cleanly, and a plume of coconut cream adds its subtly tropical flavor. To start, throw your canned coconut cream in the fridge for several hours so it’ll whip up nice and thick. Then, throw your ingredients in a pot and stand over the warm stove slowly stirring the simmering drink until it thickens to your liking. 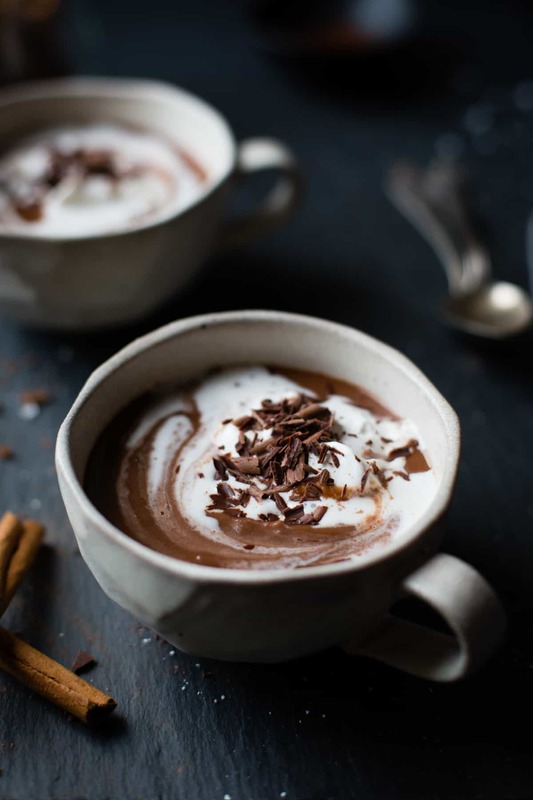 Serve mugs of champurrado topped with whipped coconut cream and chocolate shavings. Try not to drink the whole pot all by yourself. Leftovers reheat beautifully. What I love most about this drink is that its thickness comes from the starches in the corn flour rather than cream, making this drink taste surprisingly light. That’s where the coconut cream comes in; it adds a cool, rich counterpoint to the champurrado with a topnote of floral vanilla. Cups of this stuff are addictive: spicy, a little sweet, deep and rich, but light enough to drink any time of day. 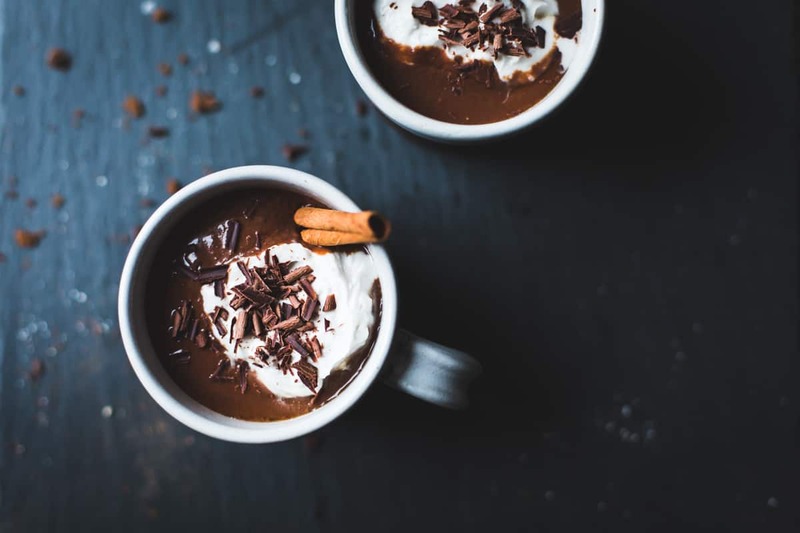 With inspiration from The View From Great Island and Serious Eats, this thickened Mexican hot chocolate goes down easy. If you don't have access to masa harina, this works equally well with corn flour, such as Bob's Red Mill brand (not to be confused with cornstarch). The coconut cream is a must; it provides a cool, mild contrast and richness to the deep chocolate drink, so do be sure to chill your coconut cream for at least 2 hours (or full-fat coconut milk such as Thai Kitchen brand) for at least 12 hours before making. 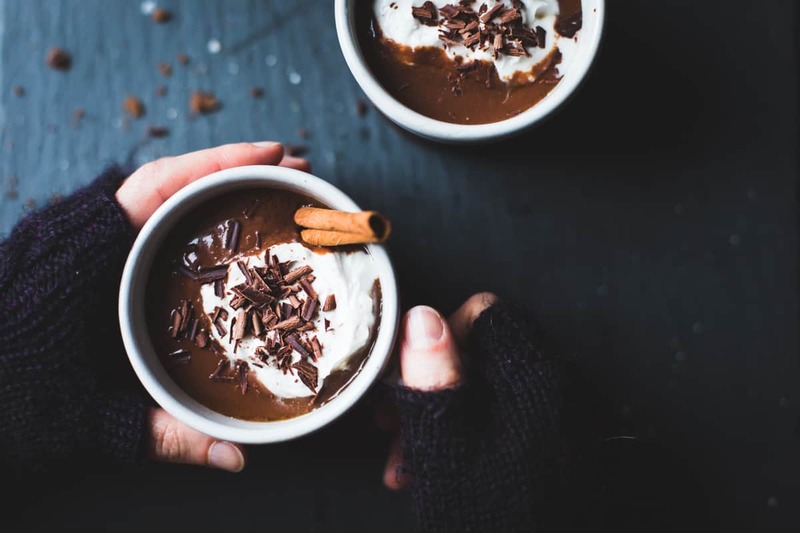 Extra champurrado can be chilled for up to several days and reheated with a little extra almond milk if needed to thin the drink. 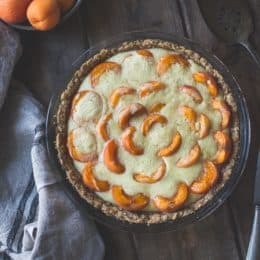 If dairy isn't an issue, this can be made with cow's milk and regular whipped cream. 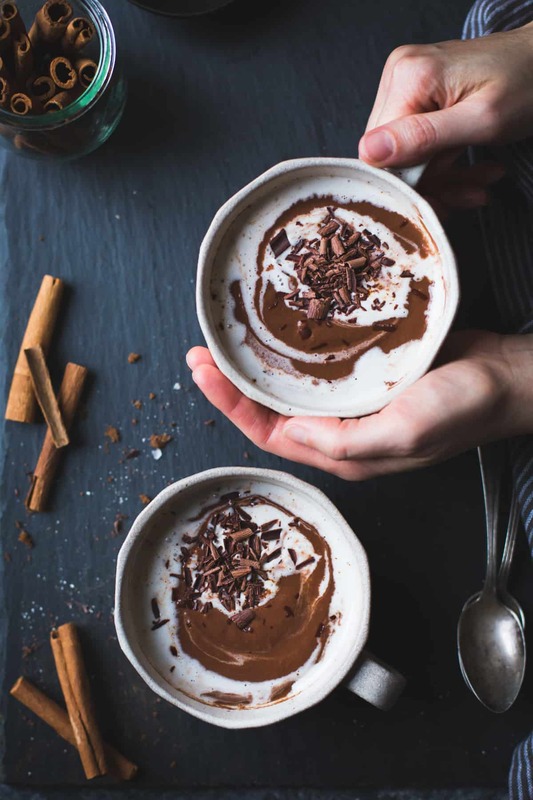 If you want to booze it up, add a splash of dark or spiced rum to the champurrado or coconut cream. To make the chocolate shavings, start with a bar of good chocolate. Scrape a side with a vegetable peeler (I like the T-shaped kind) to make tiny curls. Chill until needed. 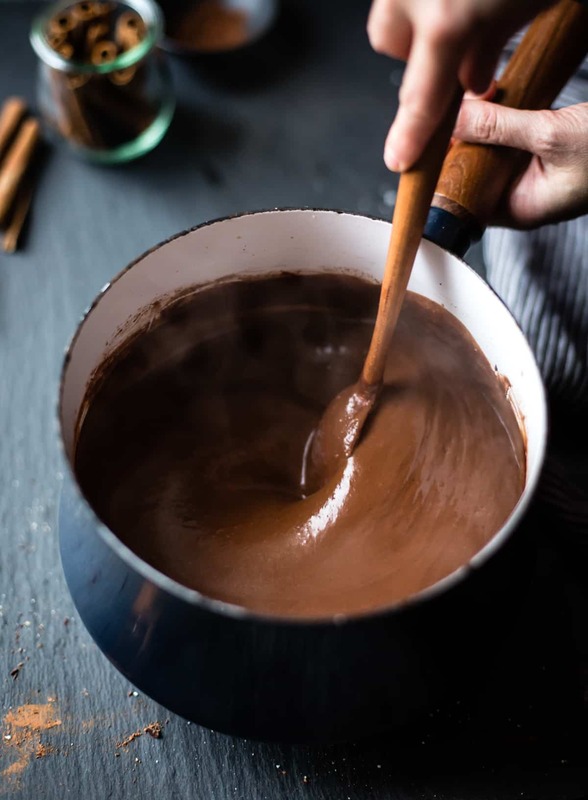 In a medium saucepan with a heavy bottom, whisk together the masa harina, muscovado sugar, cocoa powder, chili powder and salt. Whisk in the water until fairly smooth, then add the almond milk, cinnamon sticks and chocolate. Place the pan over medium-high heat and bring to a simmer, stirring frequently. Reduce the heat to medium-low and continue simmering and stirring until the mixture is smooth and thickened to your liking, 10-15 more minutes. Taste, adding more spice if you like. 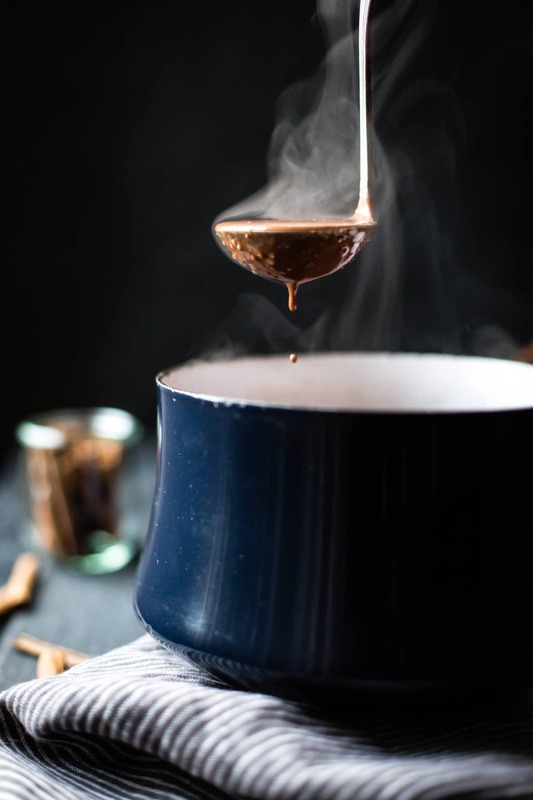 Serve immediately, or remove from the heat and let stand until ready to serve; the champurrado will continue to thicken as it stands and the flavor of the cinnamon will deepen. Thin with almond milk or water if needed. 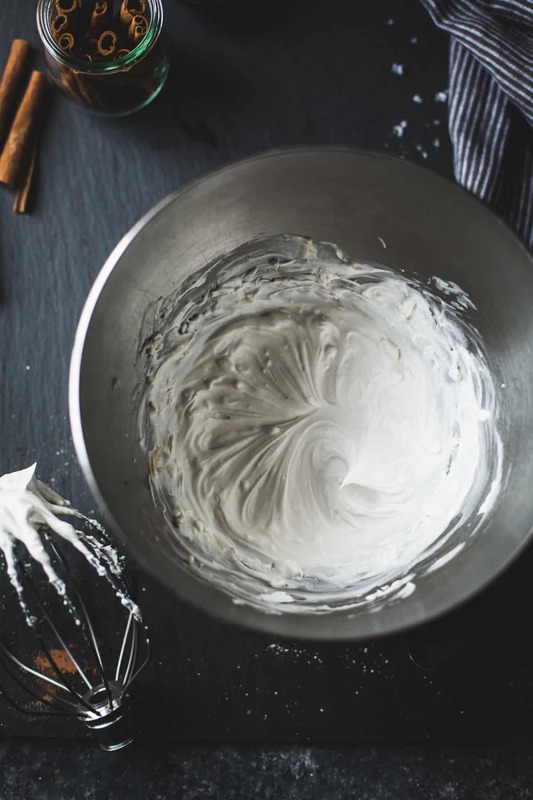 Meanwhile, make the whipped coconut cream. Without tipping or shaking the cans, remove the coconut cream from the refrigerator, open the cans, and scrape the thick cream from the top of the cans. Place in a large bowl or the bowl of a stand mixer with the powdered sugar and vanilla. Whip until soft peaks form, 2-3 minutes on medium-high. Taste, adding more sugar or vanilla if you like. 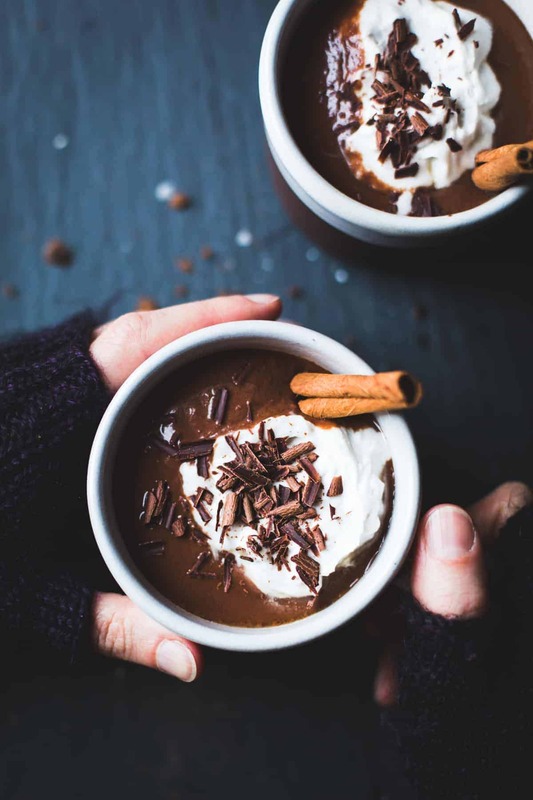 Ladle the champurrado into cups, top with a dollop of cream, a sprinkle of chocolate shavings, and serve immediately. This looks incredible! The chocolate looks so rich. Wow, it seems so creamy! I used to be given bowls of clay atole to keep me warm during Dios De Los Muertos celebrations in northern Mexico (google Dios…etc on my website search engine to read about it) and it is delicious. I wish I’d had the non milk option as a kid as I have a true lactose intolerance with serious gastric effects if I drink milk. This recipe would have come in handy. Our housekeeper used to grind masa by hand too, the smell is indescribably associated with love for me. Omg your champurrado looks amazing. What stunning photos. I made champurrado on my blog for dia de los muertos last month and it was so so good. Thicker and more complex than hot chocolate. Your vegan version sounds amazing. The nutty or coconut flavor would work perfectly. I love the photo with the steaming ladle. Yum! Luscious! I am from a family of chocolate lovers so this will be served over the holidays and apparently Day of the Dead next year. Will check back. Alanna I love reading about your pastry chef days! What a strange restaurant owner – he certainly missed out on your genius. This is an odd question I know, but do you think that another kind of flour or a starch could work for this? 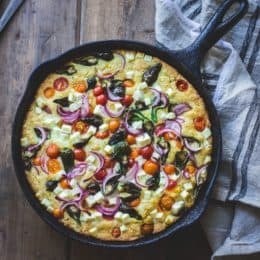 I have the most insane reaction to corn of all types but this looks like my favourite sort of thing and I’d love to try it. Please can you help me find the milky white speckled matte faceted cup? I am desperately trying to find this cup. It is on pinterest but can not trace it anywhere! I absolutely love hot chocolate and it’s great to learn about different recipes from other cultures and cuisines. I’ve recently started only exclusively using almond milk for my hot chocolates because dairy is just a no-go for my stomach and I actually prefer it much better! It really brings out the chocolate flavor and I wish I had ditched milk sooner. 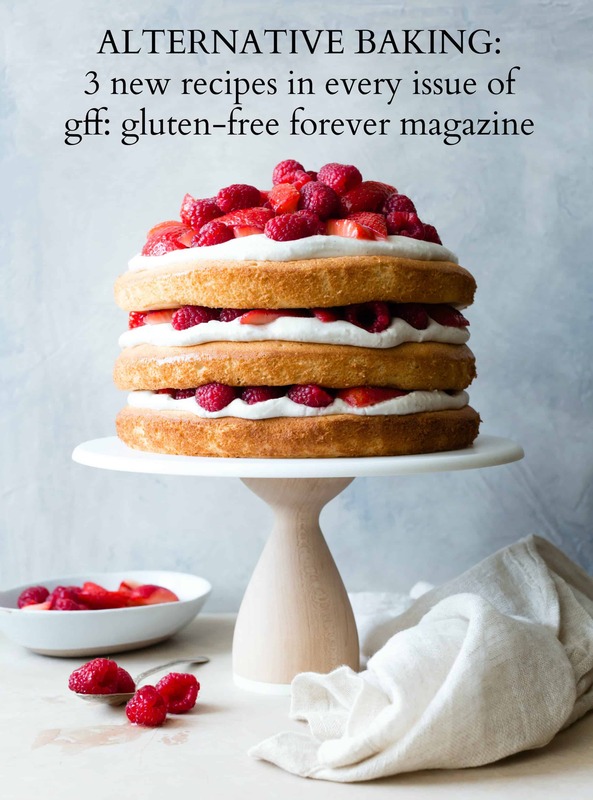 I’m really looking forward to making this and I’m even MORE excited about your cookbook! I’m going to pre-order it now! This looks so wonderfully delicious!! I love that coconut cream on top! there is NOTHING like a rich cup of hot chocolate these days, especially with a little spice! How can I get a mug of this right now?!! This is stunning, Alanna. Happy weekend! xo. I gazed deeply into your steamy photograph, Alanna, before I realized the time and I had to snap myself back to reality. Coming to my senses, it was like whiplash. Oh. My. Gawd. I’m quite taken my this recipe and am thrilled that I have masa harina on hand to whip this up sooner than later. I’ll take a spoon please and just hoard it all to my self, perhaps in a closet or something where I cannot be found. Thank you for bringing this to the light of day. Delicious my dear! Is there another flour I could sub for the masa harina (not rice flour, unfortunately)? 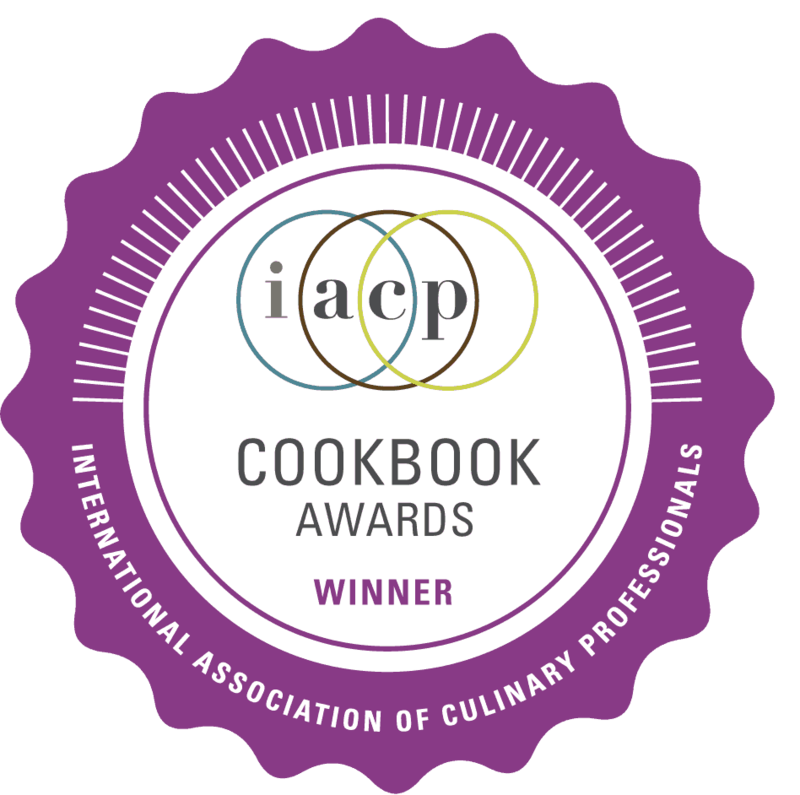 Thanks so much for the beautiful recipes! Sorry, I meant to specify that I need a substitute flour that’s gluten-free. Thanks! Hello, can I substitue corn flour to maize flour? If can’t using maize flour , what are the other flour I can use to thicken the hot chocolate? Yes, as long as the corn flour is finely ground, and not to be confused with cornstarch (In the UK cornstarch is called “corn flour”). 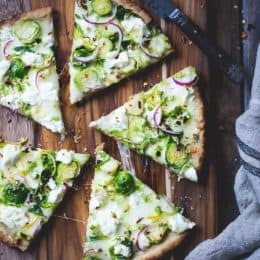 I’ve enjoyed this recipe SO much! Thank you for the inspiration! 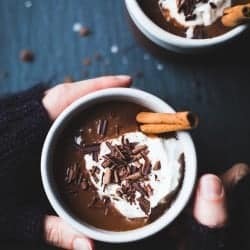 I tend to use what I have on hand and, the first time I made this champurrado, I used a dark chocolate orange (http://www.traderjoes.com/fearless-flyer/article/2726) instead of bittersweet chocolate and, I have got to say, the flavor combination was absolutely dynamite! I tried to recreate it the next time by adding orange zest with bittersweet chocolate, and it was still delicious, but it was not the same. I might try orange essential oil and see how that goes.